Around the end of 1950 the ultrasonic technology has had a wide spread not only in the field of hygiene and periodontology, but also in endodontics. Nowadays the operators thoroughly know the benefits of the use of ultrasound in the endodontic field, where a minimally invasive approach is always needed, together with magnification, in order to correctly manage tissues and have a better visibility. 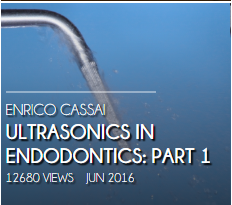 The purpose of this article is to illustrate the history and progress that the ultrasonic technology and related techniques have had over the years, to classify the various ultrasonic tips available on the market and to evaluate the different clinical applications.